TV Coverage: MSG Network (New York, live), Time Warner Communications (Tampa Bay, tape delay, 9:00 p.m. Sunday, 9:00 p.m. Wednesday, 10:00 p.m. Friday). Radio Coverage: WDAE-AM 1250 (Tampa-St. Petersburg), One-on- One Sports AM 620 (New York). K Bjorn Nittmo has made a Storm record 30 extra points in a row and scored 51 points in just four games. Photo by Chris Arnold. Looking to spread some bad news on the Ice Palace carpet, the resurgent New York CityHawks come to town tonight for their second-all time encounter with the Storm. The Storm comes home to the Ice Palace after a two-game road trip that saw the Storm win both games decisively. Tampa Bay defeated the tough Florida Bobcats 44-29 on May 23, bolstered by a 38-15 first half margin, and delivered a haymaker to the New Jersey Red Dogs last Saturday night, walloping them 81-42. It was the Storm's biggest win since a 54-7 harassment of the Miami Hooters on June 10, 1995. The 81 points against the Dogs were the most ever scored by the Storm, eclipsing the 69-point standard posted in wins over Arizona on July 27, 1996 and Las Vegas on June 2, 1995. Tampa Bay had 43 points by halftime, and with the score 57-21 midway through the third quarter, the only question that remained was whether the Storm would set a new standard. Across the river, the CityHawks did not have as pleasant a Week Five experience. New York saw its own two-game winning streak go the way of Gotham in Independence Day in a hard-fought 43-41 loss to the Orlando Predators. The CityHawks battled back from a 37-20 third quarter deficit with three consecutive touchdowns, but saw their lone lead of the night---a 41-37 edge---vanish as the Preds struck back with their first offensive touchdown of the second half on a pass from Pat O'Hara to Bret Cooper. New York, though, has already equaled their win total from 1997 and is positioned to contend for a playoff berth this time around. New York - Chuck Shelton, 2-3 in his first season with the CityHawks, 2-3 in one AFL season. Tampa Bay - Tim Marcum, 41-12 in his fourth season with the Storm, 96-24 in ten AFL seasons. New York (2-3) - Lost to New Jersey 53-34, lost to Portland 47-38, defeated Florida 42-38, defeated Albany 57-46, lost to Orlando 43-41. Tampa Bay (4-1) - Defeated San Jose, 45-23, lost to Nashville 54-52, defeated Houston 56-25, defeated Florida 44-29, defeated New Jersey 81-42. QB Mike Perez - While Milwaukee's Todd Hammel is within seven yards of breaking the league's all time passing yardage record held by former Storm quarterback Jay Gruden,. Perez is not far behind. He heads into Saturday's game with 15,008 yards through the air, just 506 yards behind Gruden and third in the league all-time. Perez tossed most of those yards with the Albany Firebirds, where he signed the club's record book with a league record in touchdown passes in one season (84, 1996), and franchise records in completions (667), yardage (9.597) and touchdowns (197). While he has continued to post solid numbers with the CityHawks, he has led the team to just four wins in 19 starts. OS Khevin Pratt - Acquired in a trade prior to New York's game against Orlando, Pratt has a history of success against the Storm. Last year, while with the Nashville Kats, he caught six passes for 64 yards and a first quarter touchdown. While with Charlotte in 1994, he hauled in eight passes for 96 yards and a 19-yard score from Tony Kimbrough as the Rage handed the defending champion Storm a stunning opening-night defeat, 44-39 at the then-ThunderDome. Taking Flight - By winning two of their first five games this year, the CityHawks have managed to equal their win total for the entire 1997 season. New York finished the disastrous campaign 2-12 and on a seven- game losing streak. The skein reached nine with two losses to open this season, but prior to their loss to Orlando on Monday night, they won two in a row, pushing their record to the .500 mark for the first time. The streak ended in a heartbreaking 43-41 loss to the Predators on Monday night, but New York has shown that unlike last year, they are not a pushover. Jet Flies for Hawks - Prior to the Orlando loss, the CityHawks made a bold move, trading offensive specialist James Bowden to Milwaukee for fellow OS Khevin "The Jet" Pratt. Pratt, who was the league's leading receiver when with the Charlotte Rage in 1994, has bounced around the Arena Football League due to his pursuit of an NFL career and franchise volatility in the Arena League. He has stints with the Charlotte Rage, Anaheim Piranhas, Nashville Kats and the Mustangs on his fuselage. Pratt left the Kats after the first month of the season last year in a failed attempt to make the Philadelphia Eagles of the NFL. From the Home Office in Wahoo, Nebraska - Once again, the man whose name David Letterman used to love uttering, kicker Bjorn Nittmo, scrawled his name in the Storm record book, this time with two single-game marks---most extra points in a game (10) and most points by a kicker in a game (19). The old records were held by Jorge Cimadevilla, who nailed nine extra points and 15 total points at Las Vegas on June 2, 1995. Nittmo made three of four field goals, as well, tying the Storm record set by...who else?...Nittmo. The 19 points also were the second-best in league history; only Milwaukee's Kenny Stucker, with 21 in a game against Las Vegas in 1994, can top Nittmo's mark. 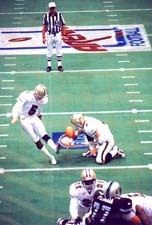 Tampa Bay-New York Connections - New York kicker Mike Black resides in Clearwater.. CityHawk WR/DB Eddie Brown played with the Storm from 1992 until 1996, when he was traded to the Connecticut Coyotes...New York trainer Chuck Reda served in the same position with the Storm from 1991 to 1993...Lineman Roosevelt Nix had his rights traded to the Storm last year, then had them sent back to the CityHawks when lineman Kent Wells failed to pass his New York physical. Why, We Didn't Expect You Back So Soon - Saturday's game marks the return to the Ice Palace of CityHawk lineman Wilky Bazile. On May 22, the Syracuse product and Spring Valley, N.Y. resident was given the chance to play closer to home, as he was traded by the Storm to New York on May 22 for the ever-popular Future Considerations. Reportedly, Future Considerations, who seems to be traded from one Arena Football team to another on a semi-weekly basis, can play any position, from kicker to quarterback to lineman to receiver to safety and anywhere else the coach asks him to go. Turning Over a New Leaf - Perpetually a pestering problem for the Storm in the last two seasons has been turnover ratio. Tampa Bay finished the 1997 season with a minus-seven imbalance, and carried the same figure through four games of 1998. However, against the Red Dogs, it almost completely turned around. The Storm forced six turnovers---four fumbles and two interceptions. Tampa Bay, with its minus-one ratio now has a chance of breaking back on the happy side of even for the first time in two seasons. Countdowns - FB/LB Andre Bowden, who gained nine yards on six carries and scored last week, needs 38 yards to move into fourth place in league history in rushing; he currently has 655 yards on 198 carries...Lineman Sylvester Bembery, the league's all-time leading sacker, needs one to get to 40 for his career...Storm coach Tim Marcum is just four wins away from becoming the first Arena Football League coach to reach the century mark in victories. Jive Talkin' - Late in the third quarter of last week's whipping of the Dogs, Storm coach Tim Marcum was whistled for four penalties in the space of two minutes. Marcum and the officials were in discord about where the coach should be on the field of play. Fortunately for the Storm, those penalties cost the club only six yards, since the dispute began when the Dogs had a first-and-goal from the Storm seven-yard-line. Three of the penalties were unsportsmanlike conduct fouls on Marcum, but they were merely assessed at half the distance to the goal line. Love Is(n't) a Wonderful Thing - Tuesday morning's early 9 a.m. practice on the Ice Palace carpet was their last home field work the Storm will get before Saturday's game. Concerts have given the team the boot yet again, with this week's attractions being one-time-wanna-be-headbanger Michael Bolton (with any apologies going out to those who might happen to be fans of his mid-80s "hair metal"-era body of work) and country singer Clint Black. Originally, the Storm planned to practice at Blake High School. However, a combination of oppressive heat and humidity sent the Storm to an indoor soccer facility in Brandon. Tampa Bay practiced there, on a field shorter than AFL regulation, on Wednesday, Thursday and Friday. Injury Front - WR/DB Cornell Parker remains on injured reserve with a hamstring injury. So too, does WR/DB Kevin Jackson, with a broken index finger...OS Wayne Walker is doubtful with a pulled groin and was deactivated on Friday. Deactivated Players - Tampa Bay deactivated Walker, lineman Keo Coleman, WR/DB Antoine Worthman and FB/LB Cedric McKinnon...Worthman's deactivation is his first of the season, while Coleman sits out a second straight game and McKinnon rests for the fifth time in six games...Deactive for the CityHawks are OL/DL Avo Avetisyan, WR/DB Ray Stukes, OL/DL Patrick Jackson and OL/DL Bret Kwarta. The teams have met once, with the Storm holding a 1-0 edge.